If you’re looking to add some Garden Sparkle and you’re not sure where to start, be inspired by my story. Childhood is a time of imagination and wonder. A time to believe in the impossible, to feel safe, secure and free to explore the world around us. We believe children should be encouraged to allow their imaginations to roam and be free. 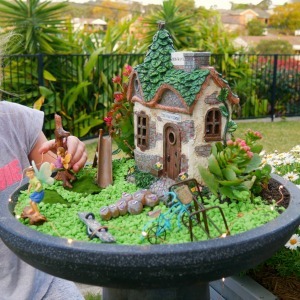 My daughters and I set up a fairy garden in an old, cracked bird bath that we wanted to repurpose. The girls wanted a fairy garden school theme, so the fairies were given a beautiful outdoor playground. The playground was complete with swings, a slide and a bike rack for parking their bike. The fairy house we chose was the Tooth Fairy School. It’s awesome as the sun fades and it begins to get dark that the solar house lights up. In the evening’s my kids imagine the lights guide the fairies when they have been out after dark. I can honestly say, this fairy garden has been an awesome project. Not just as a project but it has also delivered enjoyment every evening as it lights up. The warm glow of our enchanted fairy garden certainly warms our hearts. Nowadays, we are inundated with ideas for things to do and it can all become very overwhelming and very costly. It’s easy to feel guilty about all the things we don’t decide on and whether this will impact on our children’s growth into happy, well rounded, confident individuals. Sometimes it’s the little things that make the biggest difference. We all know how easy it is to be dragged into the shops at the weekend and encouraged to buy the latest plastic fad. Sometimes saying yes to keep the peace becomes the easier option. Rightly or wrongly, I’m sure we have all been there. 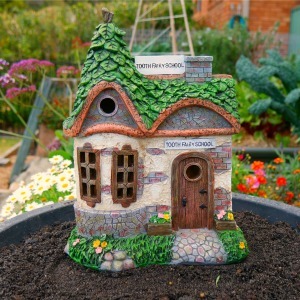 A common phrase I heard at home as a child was ‘quality, rather than quantity.’ In this situation, investing in a Garden Sparkle fairy garden highlights just that. It’s an investment which will continue to provide joy for many years, rather than the piece of plastic that ends up broken and thrown in the bin. Let’s face it, how much of what we buy for our children do we still see them enjoying months later? My father has gnomes in his garden that he has had for years. As they have weathered, he has sat and patiently repainted them to bring them back to life. I know one day those gnomes will be passed on to our kids for them to place in their very own gardens. It’s great to constantly keep in mind our decisions and how we impact our environment. Creating something with kids that’s more sustainable and has some longevity around it, certainly made us think more about it. These are the type of project that will continue to make our kids smile for years to come. You never know, one day, they may just be handed down to our next generation.